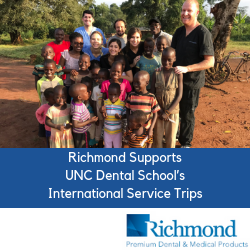 Richmond Dental and Medical is proud to support dental schools around the country, and we have a special place in our hearts for the School of Dentistry at our home state’s flagship, the University of North Carolina at Chapel Hill. This summer, we donated dental supplies used by students and faculty on four of the school’s signature international service trips to Malawi, Mexico, Nepal, and Uganda. The School of Dentistry at UNC-CH has sent students on global humanitarian missions for more than 20 years. Through its new Office of Global Initiatives, the dental school is currently sending teams to Brazil, China, India, Malawi, Mexico, Moldova, Nepal, Nicaragua, the Philippines, and Uganda. This summer, the University of North Carolina at Chapel Hill School of Dentistry again ranked as the number two dental school worldwide, according to the 2018 Academic Ranking of World Universities (ARWU)—an annual ranking released by the Center of World Class Universities at Shanghai Jiao Tong University. In Malawi, students traveled to the town of Lilongwe’s Kamazu Central Dental Clinic, where they provided emergency, preventive, and restorative care to populations from remote villages, schools, and the Lilongwe Hospital. They also educated school children about oral health and hygiene, HIV/AIDS, and associated risks. The student-run mission is part of a cultural exchange program between UNC-CH and Malawi’s Mzuzu University. The school’s longest-standing international service trip is its mission to Mexico, where UNC Dentistry students have been travelling since 1986. This year, five students spent nine days in the country, practicing restorative dentistry with than 90 patients, mostly orphans and seniors. The students visited the cities of Puebla and Oaxaca, as well as the capital, Mexico City. During a recent trip to the UNC School of Dentistry, a delegation from Richmond Dental and Medical met with a pair of students from the Charlotte area, Bobby Porter and Jake Laxer, who had served on trips to Uganda and Nepal, respectively. Porter’s team, spent the first week of the trip taking in the sights, sounds, and cuisine of the city of Kampala. During the second week, Porter and the UNC students partnered with the country’s Makarere University of Health Sciences, providing oral care to adults and children in isolated parts of Uganda. In addition to providing oral care, the students from UNC and Makarere taught good oral hygiene practices and provided dental supplies to the 500 patients served over five days in the bush. Laxer’s UNC team traveled to Nepal, visiting the ancient city of Kathmandu in July and August, while also providing dental care and oral healthcare supplies to those in remote villages and orphanages throughout Nepal. They administered oral hygiene instruction, oral screenings, restorations, extractions, and cancer screenings to more than 300 patients in three days.